Overview: Tensions between two sets of half-brothers explode into a tragic family feud. International Film Circuit; 2007; Rated PG-13; 92 minutes. From the Beginning: From the very first minute, we are deafened by the quiet. It’s in the distressed position of that long body. That fatigued breathing.The walls of the house too low for the curtains—a woman’s touch. The flip of the cards onto the nightstand. The empty drawers. The buckshot scars on his back. This is a movie about a particular type of mean-ness. Not everyone has lived in or around places like this, but most of us have seen them, driven through them, and we know the recognition of that electric implication. That’s here. This is a movie about the part of America that usually doesn’t bother to write itself into books and movies. To refer to the movie’s dialogue as “terse” would stimulate a preconceived notion that would be an injustice to the film and the viewer. Conversations are barely that. Stripped down to colloquialisms, sentence fragments, and humming nods, first-time director Jeff Nichol has an ear for the language of his native Arkansas. Viewers shouldn’t be fooled by the lack of dialogue, however. There is a language here, and a poetic one—built of camera positions, facial expressions, open landscapes and worn structures. The narrative twists and arcs into the sort of revenge-driven, cross-family power struggle of Shakespearean measure. 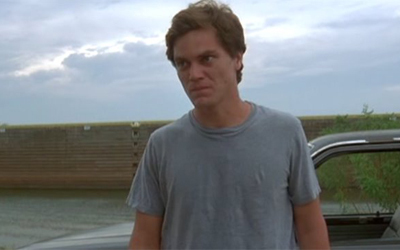 Michael Shannon: In the middle of a decade during which dynamic character and method acting were celebrate d (Benjamin Button, Daniel Plainview, Harvey Milk), Michael Shannon daringly attempts a forgotten, or as-yet-discovered, style of performance. Shannon stars as Son (his brothers’ are named Kid and Boy in the most minimalistic yet impactful names you will ever see assigned in a movie). Son is the understood leader of his brothers, who fall into a feud with their father’s second family, a family given real names and a better chance at life. The performance that creates Son is all gesture, tense muscles, contorted back, measured breath. It involves the forehead, cheeks, forearms. When the film ends, we are left with the impression that we have served witness to an intense wave of violence; although the movie hides nearly all of its fights and tragedies off-screen, we are still right. The violence is implicit in Shannon’s near-silent performance. We are shaken. American Literature: With Shotgun Stories, Nichols establishes not just a powerful debut film, but a landmark of great American literature. Be assured: Nichols’ version of the gritty, menacing working class town is every bit as American as Spike Lee’s angry, divided New York, Affleck’s rough-and-tumble Boston, or even Flannery O’Conner’s ruined south , where dying gentile values and Catholic impracticality hash it out with moral corruption and human nature. If those regions are the heart, muscle, and soul of this country, then towns like that in Shotgun Stories are the black eye, the clenched jaw, the bruised knuckles. And poison in an appendage is poison for the body. The undisciplined fury that we feel in these characters moves through impoverished and dying subcultures in America. The same broken concepts of manhood here have been recycled to the point of uselessness and real, young men are struggling with them, often with tragic results for families or even murderous mishandlings. This is as real as any American conflict, and it’s high time we included it in our art.